We begin 2015 wih a look at protection spells, as well as some talismans of interest. We also have an adorable background guest star visitng us. Some of the various protective charms and talismans we discuss include: horsehoes, silver (including Mercury dimes), salt, iron, evil eye beads, the ojo de dios/God’s eye, dreamcatchers, gargoyles, the rowan cross, the SATOR and Abracadabra charms, and High John root. 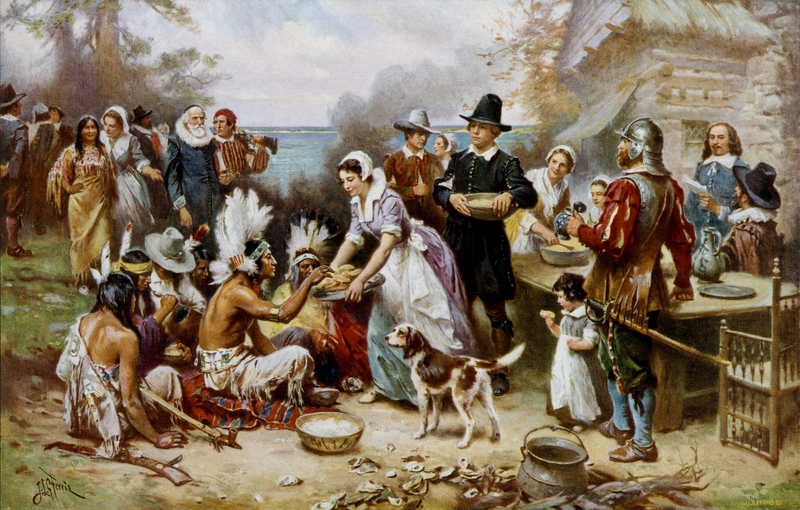 I thought in honor of the recent Thanksgiving festivities—at least those here in the US (and with a belated bow to the harvest feasting in Canada), I would take a brief look at some of the magical practices circulating around the time of that “first Thanksgiving.” The people who arrived in places like Plymouth and Massachusetts Bay to settle the New World—never mind it was already quite settled by its native inhabitants—are commonly referred to as Pilgrims, and contemporarily would have been known as Separatists. Thinking about that late autumn gathering, when the local Pawtuxet tribe and the Separatists who had survived the harsh New England winter and managed to put together enough bounty for the coming cold season gathered at the table, is a sort of fond romance or fantasy. Often we imagine the Indians in their deerskins and the Pilgrims in their blackest hats with the shiniest buckles on them. The staunch Calvinism of the Separatists contrasts with the “noble savage” imagery of the Natives, their shared meal demonstrating two very different worlds breaking bread together. Yet both groups shared many things in common, including a set of magical practices aimed at protecting their homes and blessing themselves with prosperity. Looking at these specific examples, we can see a few things which indicate that magic among the Pilgrims was not so uncommon. The Sieve & Scissors – These items were commonly used in fortune telling games by young girls, particularly on exciting nights like Halloween. They could also be used to confuse or cut a witch, magically speaking. The Sieve and Shears appear in Aggripa’s Three Books of Occult Philosophy, as well. The Bible & Key – The Bible was considered to have inherent magical and protective abilities, and the key likely held the symbolism of “locking away” or “locking out” any harmful witchcraft. The use of the two together also formed the basis of a spell recounted in Reginald Scot’s Discoverie of Witchcraft: “Popish preests …doo practice with a psalter and a keie fastned upon the 49[th] psalme, to discover a theefe” (Scot, Chapter V). The Egg White in a Glass – This is another method of divination involving cracking an egg into a clear glass or jar of water, then reading the resulting shapes, strings, bubbles, and colors found in the glass. Curanderismo continues to use this method as a regular part of cleansing and reading practice even today. The Horse-shoe on the Threshold – This particular charm moves out of the realm of divination and into prosperity and protection magic. We covered horseshoes on our Lucky Charms podcast, and you can read all about them at the Lucky W Amulet Archive page on the subject. The iron in the shoe, plus the somewhat mystical nature of the animal associated with it, imbued this charm with the power to block witchcraft and provide good luck to those passing under it as they entered a Pilgrim’s household. The Stone in the Stable – The stone referred to in this charm would likely have been a holed stone, one which had been naturally eroded to leave a gap by which it was then hung in places needing protection from malefic activity. Sarah over at Forest Grove wrote a bit about these holed stones, saying “In the UK it was used as a protection charm as the locals believed that by tying their front door key or the stable door key to a hole stone they would protect the building it hung upon.” This, much like the horseshoe, was primarily protective, but a holed stone could also be used to “see” witches and other Otherworldly entities by peering through the gap. Leland recounts several legends of warriors and magical Indians doing battle with terrible spirits, the dead, and other dangerous forces. In one tale, a chief’s son, described as “a great hunter, and skilled in mysteries” decides to marry. In his efforts to get a wife, he sets out on a journey in which he acquires many talismanic and shamanic tools. One of them is a golden key pulled from a whale’s mouth, which the whale tells him has great protective power: “While you have it you will be safe against man, beast, or illness. The foe shall not harm you; the spirits which haunt the wilderness shall pass you by; hunger and pain shall not know you; death shall not be in your road.” The key, then, appears in both the European and Native magical traditions as a powerful amulet. “Each primitive Indian has his guardian manitou, to whom he looks for counsel, guidance, and protection. These spiritual allies are acquired by the following process. At the age of fourteen or fifteen, the Indian boy smears his face with black, retires to some solitary place, and remains for days without food. Superstitious expectancy and the exhaustion of famine rarely fail of their results. His sleep is haunted by visions, and the form which first or most often appears is that of his guardian manitou, a beast, a bird, a fish, a serpent, or some other object, animate or inanimate. An eagle or a bear is the vision of a destined warrior ; a wolf, of a successful hunter; while a serpent foreshadows the future medicine man, or, according to others, portends disaster…The young Indian thenceforth wears about his person the object revealed in his dream, or some portion of it—as a bone, a feather, a snake-skin, or a tuft of hair. This, in the modern language of the forest and prairie, is known as his “medicine.” The Indian yields to it a sort of wor ship, propitiates it with offerings of tobacco, thanks it in prosperity, and upbraids it in disaster. If his medicine fails to bring him the desired success, he will sometimes discard it and adopt another” (Parkman 4). Feast or famine, magic has long been on American soil (and Canadian, Central American, & South American soils as well). So as you eat your turkey leftovers, you could crack an egg into a glass of water, pull out some scissors and a sieve, or maybe even think about putting the food aside for a while and seeing what comes to you in your dreams. It might add a little New World Witchery to your holiday. Which, of course, makes me feel pretty darn thankful. 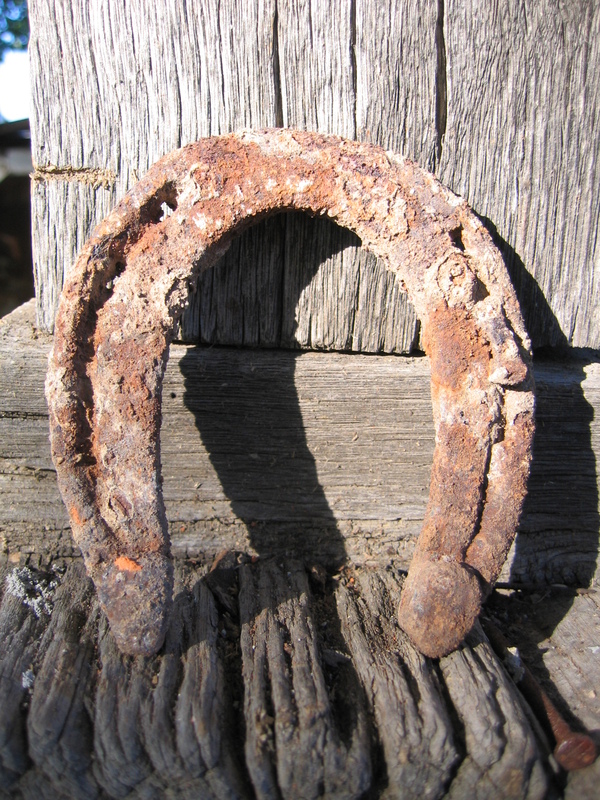 I like this particular examination of the horseshoe because it details two points: 1) the horseshoe’s luck comes from its association with the horse itself and 2) as Talley states, the luck is accumulative, so the longer a shoe has been on a horse, the luckier it is. I hope to get into some of these symbols and ideas in other posts at another time—particularly iron, which shows up a lot in fairy doctoring practices and other magical systems—so for now I think it suffices to say that horseshoes have a lot of lore to build upon and are quite lucky, though no one seems to know exactly why they are so. So how does one use horseshoes? First of all, the shoe needs to be one which actually has been on a horse at some point (remember all that pounding of luck into it in Jeannine Talley’s article?). Likewise, there are some who say that hanging a horseshoe involves using a spent horseshoe nail, too. That seems to be a slightly less stringent requirement, but if you happen to have a spare horseshoe nail with your horseshoe, why not use it? The issue of which way the “horns” of the shoe are pointing seems to be hotly contested by those who concern themselves with such things. Both opinions seem to have some sound reasoning behind them, which I mentioned in the most recent podcast. The general idea boils down to whether you think the horns up are “holding in the luck” or whether the horns down are “pouring the luck out on you.” Either way, I think this is where instinct kicks in. If you feel like you’ve hung it the “wrong way,” you probably have and you should switch it. But if you feel like your luck’s in good condition and your horseshoe’s “right,” then leave it be. THESE WILL BRING YOU GOOD LUCK. all de time, an’ jes’ leave it dere an’ dat’ll be good luck fo’ yo’. KEEPS SPOOKS OUT AND BRINGS LUCK. lak dat, because a mule is a hard-workin’ thing, hard-workin’. All right. eat, people be coming to his place and say…. I like the first example because it combines the lucky penny with the lucky horseshoe, and places luck at your head and your feet, so every time you enter a door, you get caught between the two and get a double dose of luck. I also like the rationale for using a mule shoe to boost business (because the mule is so hard-working). So that’s the lucky horseshoe. Another long article, so I apologize for that, but hopefully you aren’t too bored. Skimming is probably a good skill to apply when reading these blogs. 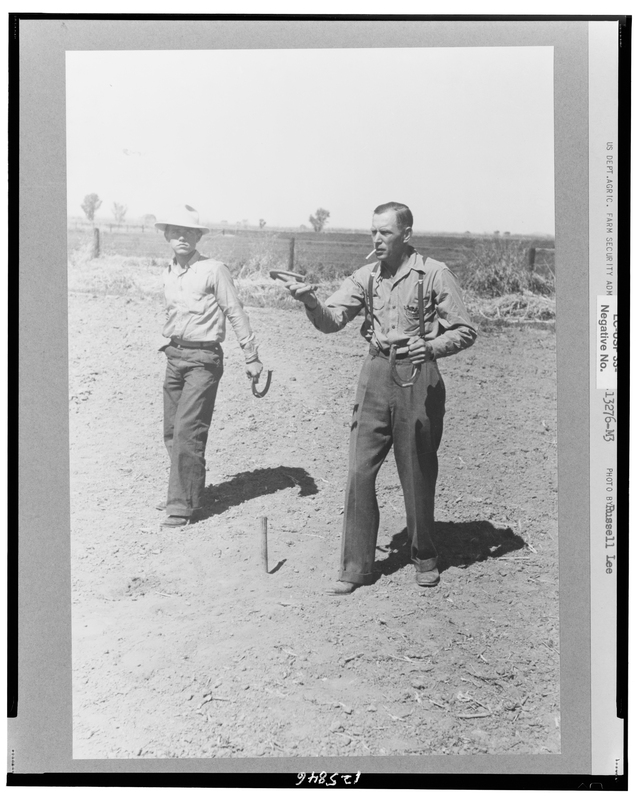 At any rate, if you have any questions or comments about horseshoes, please feel free to post them!